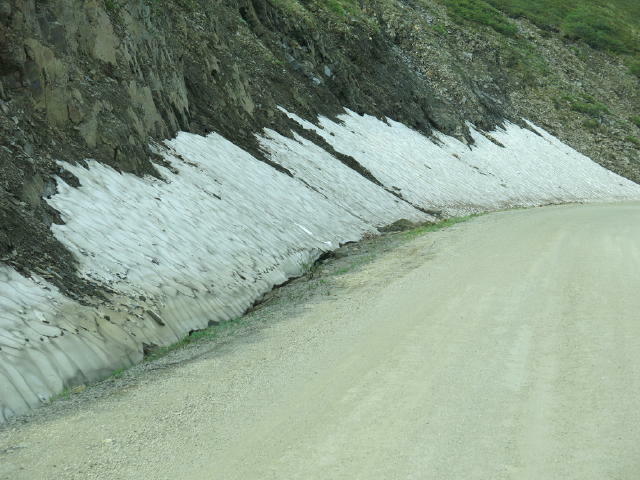 As we continued on the Top of the World Highway, we actually came upon snow banks in the shade of the mountains. When we crossed the Border, Jane snapped a photo of the crossing at Poker Creek which had a population of 3 on the US side (all Border personnel) and likely the same on the CDN side! This crossing is the northernmost Border point and it will close in mid-September when the road is closes for the winter. We proceeded to Chicken, AK on some awful mountaintop roads. This community has no outside sources of power, water and so on. They generate their own power, truck in water and all supplies, then truck out all waste. 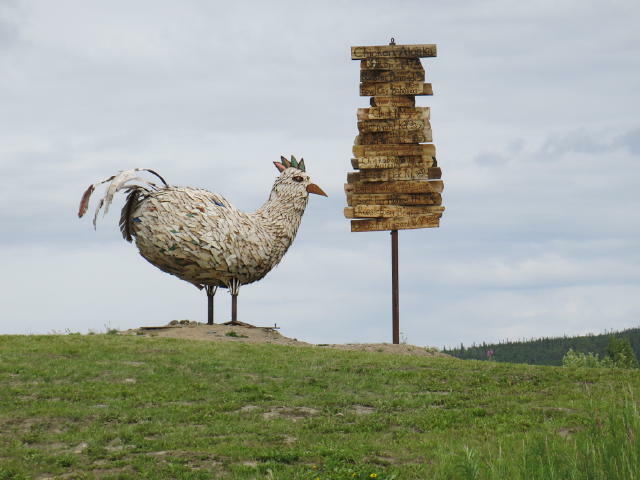 It is a pretty simple community which depends upon tourists for business. We camped in a pull off on the side of the highway an hour farther down the highway. We enjoyed basic internet connectivity using our travel companions (Ron and Sandy’s) roof-mounted Satellite dish for service. It was a cool night and we had lots of rain and fog. We also noticed the beginnings of a coolant leak. We topped it up and travelled the next day. 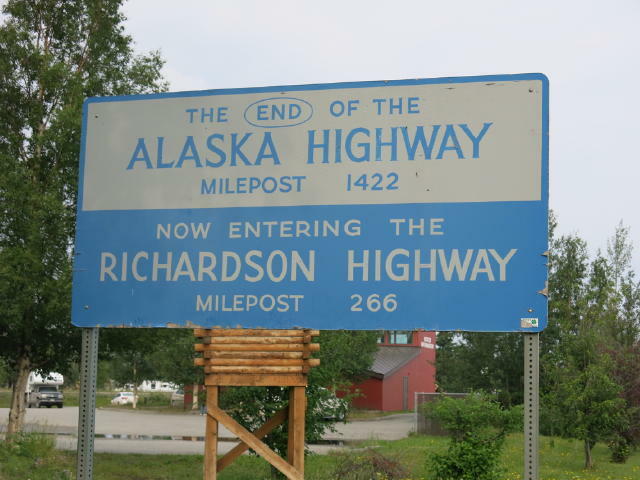 When we arrived in Tok, AK we were back on the Alaskan Highway. You have no idea how good it felt to once again travel on truly ‘paved’ roads with line markings, and to have cell and data service. We actually saw homes beside one another, far different than what we experienced over the prior two days and much of the trip. While we did not take photos of our coaches before spraying them off, the next photo shows what we and all others looked like after travelling the highway. We actually had so much mud on the car front that we had to work hard by scraping to get it off before removing the protective cover. We used the carwash wand to spray off both the inside and outside of our basement storage bins and doors, then spent hours finishing the cleanup. Fine dust had infiltrated into the coach interior as well and it covered all surfaces with an obvious layer everywhere. It was amazing because all exterior windows and doors were closed while travelling and the vehicle air conditioning system was set to draw its air from inside not outside. 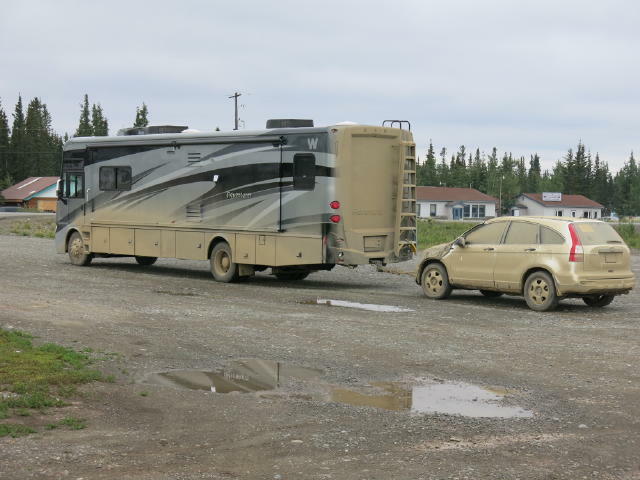 We checked the coolant level and topped it up with the remaining fluid we had brought along, then drove to Delta Junction the next day. 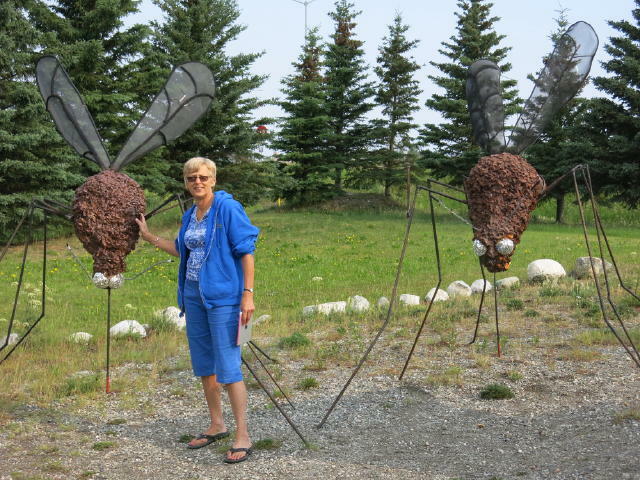 This town is the end of the Alaskan Highway and we took the requisite photos of the signs signifying that, together with photos of some huge mosquitos that supposedly inhabit Alaska! We had not been able to obtain organic 50-50 coolant that was factory installed in our coach’s cooling system and were told that no one would have that coolant since they use a minimum of 60/40 and often even higher ratios. Their rationale was that the engines would freeze with 50-50 and no one would pay to ship water in the mixture up to Alaska. They only sell the straight 100% concentration, however none had a compatible formulation. So, we added 4 litres (1 gallon) of distilled water and carried on monitoring the coolant temperature very closely. The system holds about 40 litres (about 10 gallons) so while we added a lot, it was not as dramatic as it seems. We drove 160 km (100 miles) monitoring coolant and oil temperatures, which never rose above normal. 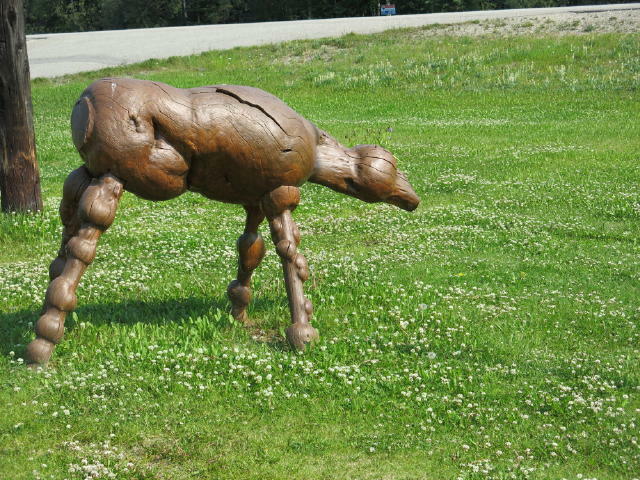 We stopped at the Knotty Pine Store which had the animals and all sorts of knotty pine carvings shown in the photo. I concluded these people have way too much time on their hands! Checking the engine showed a lot of coolant had sprayed over many components, raising my concern, however temps were still normal. After we drove through the "North Pole” with a huge Santa, a Christmas Store and candy cane light standards everywhere, we passed the air base right beside the highway. Two B52 bombers were in plain sight together with numerous signs stating "No Stopping, No Parking, No Photos …. Under order of the military with any violators being prosecuted to the full extent of the law” This is not what you want to see when you know that you are leaking coolant and have no idea when you will need to stop! Fortunately we made it by without incident! 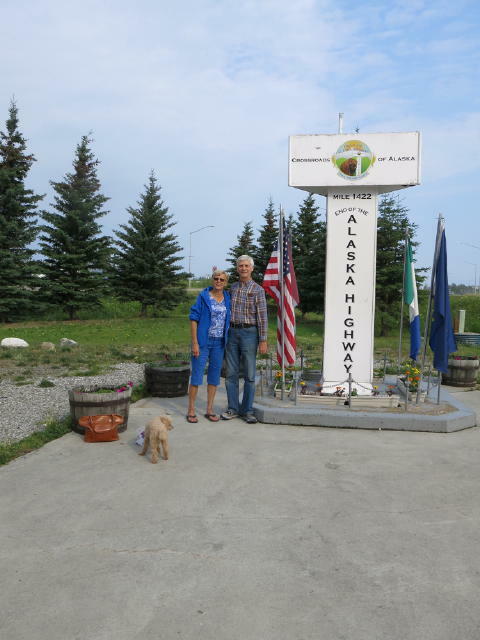 We arrived in Fairbanks, Alaska, a modern military and University town and have enjoyed, nice city features, modern roads and amenities. We were also able to book a service appointment early on Monday for our coach even though we were delayed in getting in because of the Independence Day holiday. 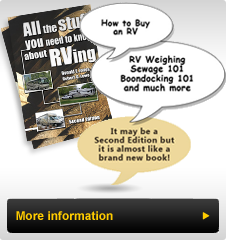 I had added 3 gallons (12 liters) of distilled water and it was quite apparent when we arrived at the Cummins shop that the coolant pump had a serious leak around the shaft, requiring replacement. A new pump was in Anchorage and had there not been one there we would have obtained one from Cummins in Tennessee, all overnight! So, back to the campground by 9:30am, time for hair appointments, gift shopping and touristy things. 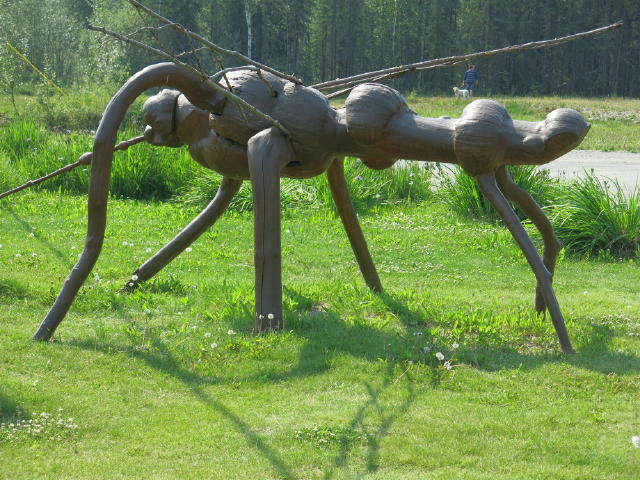 On Tuesday, we dropped off the coach, took the dog in for grooming and went to the University of Alaska, Fairbanks Large Animal Research facility for a tour. We saw reindeer, caribou and muskox through very thick smoke in the air. (Lightning starts most fires in Alaska and millions of acres of land burn each year). We wondered why there were no fireworks around the holiday and learned that fireworks (both sale and use) were banned in the boroughs of Fairbanks. It was a quiet July 4thcelebration, which all pets and many of us appreciated. If you look at the next few photos of the animals you can clearly J see the smoke haze when comparing these photos to the others. We learned that Santa’s reindeer must all be female since the males lose their antlers after the fall rut. 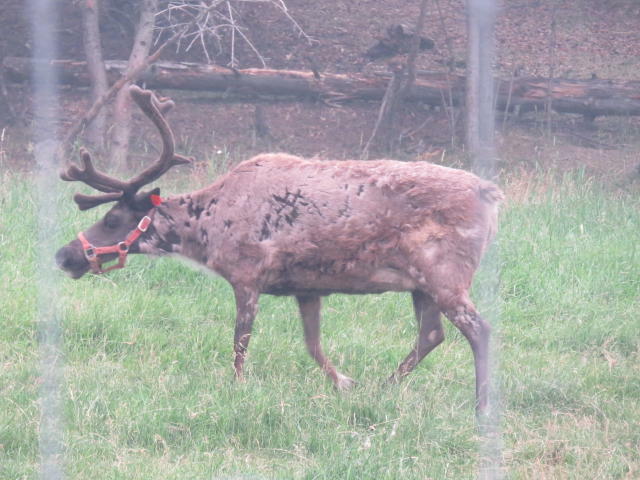 The females keep their antlers to fend off other animals during their 8 month gestation period for the little ones. If you look at the female in the photo, you’ll see she is losing her winter coat, has lost her antlers and they are re-growing after having given birth two months ago. The Muskox is already farther south in this sanctuary than they would be in the wild and the day before it was 34C (94F). They have incredibly warm coats and in fact their finest fur (qiviuk) is now harvested and spun into the warmest of warm garments. 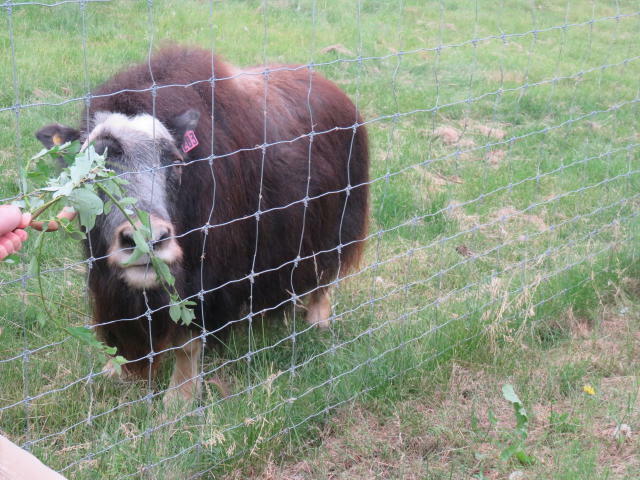 This research facility studies the biology of these animals, the history of the herds, how they can survive in unbelievably cold winter weather and so on. The beauty of creation is clear when you learned how these animals cope. They certainly suffered in the heat of the day before. Fortunately the temperature was 15C (60F) the day we visited. Later in our trip we will see another farm in Palmer, AK where the viability of herds growing for commercial purposes is being studied. 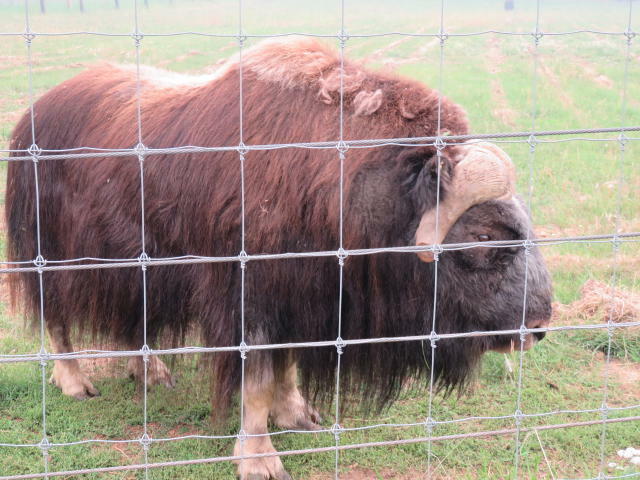 It looks like a domestic AK wool industry using Muskox "wool” is a possibility and commercial Reindeer Meat production may also be possible. 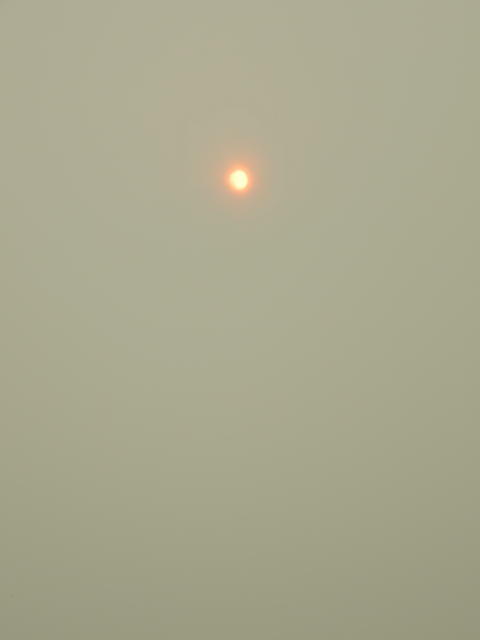 I took a picture looking up at the sun and initially the camera could not discern the sun through the smoke. It was pretty thick and we did all we could to keep the smoke out yesterday. We heard today that they do not expect the smoke to fully clear until into November even though winter will begin in October. Pretty amazing! We’ll connect over the next week or so. Enjoy!